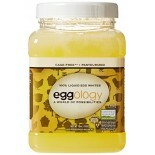 Attributes: Natural or Organic IngredientsIngredients: Cage free egg whites, 1% or less of the following: natural flavors, color (includes beta carotene), spices, salt, onion powder, xanthan gum, guar gum, maltodextrin. 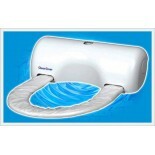 Vitamins and minerals: calcium sulfate, iron (ferric orthophosphate), Vitamin E .. 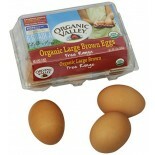 Attributes: Natural or Organic IngredientsIngredients: Grade A Brown Eggs.Nutritions: Calcium(2), Calories(70), Cholesterol(215), Dietaryfiber(N/A), Fromfat(40), Iron(4), Protein(6), Saturatedfat(1.5), Servingscontainer(12), Servingsize(1 egg (50g)), Sodium(65), Sugars(N/A), Totalcarbs(1), Totalfat(.. 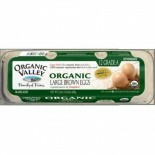 Attributes: Kosher, Natural or Organic IngredientsIngredients: Grade A Brown Eggs.Nutritions: Calcium(2), Calories(70), Cholesterol(215), Dietaryfiber(N/A), Fromfat(40), Iron(4), Protein(6), Saturatedfat(1.5), Servingscontainer(12), Servingsize(1 egg (50g)), Sodium(65), Sugars(N/A), Totalcarbs(1), T.. 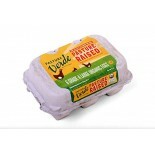 Attributes: Kosher, Natural or Organic IngredientsIngredients: Grade A Brown Eggs.Nutritions: Calcium(2), Calories(70), Cholesterol(215), Dietaryfiber(N/A), Fromfat(40), Iron(4), Protein(6), Saturatedfat(1.5), Servingscontainer(6), Servingsize(1 egg (50g)), Sodium(65), Sugars(N/A), Totalcarbs(1), To.. 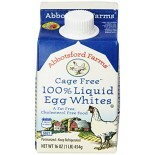 Attributes: Kosher, Natural or Organic IngredientsIngredients: Grade A White Eggs.Nutritions: Calcium(2), Calories(70), Cholesterol(215), Dietaryfiber(N/A), Fromfat(40), Iron(4), Protein(6), Saturatedfat(1.5), Servingscontainer(12), Servingsize(1 egg (50g)), Sodium(65), Sugars(N/A), Totalcarbs(1), T.. 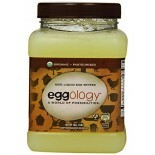 Attributes: Kosher, Natural or Organic IngredientsIngredients: Grade A White Eggs.Nutritions: Calcium(2), Calories(80), Cholesterol(240), Dietaryfiber(N/A), Fromfat(45), Iron(4), Protein(7), Saturatedfat(1.5), Servingscontainer(12), Servingsize(1 egg (56g)), Sodium(70), Sugars(N/A), Totalcarbs(1), T.. Attributes: Natural or Organic IngredientsNutritions: Calcium(2), Calories(70), Cholesterol(185), Dietaryfiber(N/A), Fromfat(45), Iron(4), Protein(6), Saturatedfat(1.5), Servingscontainer(12), Servingsize(1 Egg (50g)), Sodium(70), Sugars(N/A), Totalcarbs(70), Totalfat(5), Transfat(0), Vitamina(6), V.. Attributes: Cholesterol Free, Fat Free, Kosher, Natural or Organic IngredientsIngredients: Fresh egg whites.Nutritions: Calcium(0), Calories(60), Cholesterol(0), Dietaryfiber(0), Fromfat(0), Iron(0), Protein(13), Saturatedfat(0), Servingscontainer(15), Servingsize(1/2 cup), Sodium(200), Sugars(1), T.. Attributes: Kosher, Natural or Organic IngredientsIngredients: Fresh egg whites.Nutritions: Calcium(0), Calories(60), Cholesterol(0), Dietaryfiber(0), Fromfat(0), Iron(0), Protein(13), Saturatedfat(0), Servingscontainer(N/A), Servingsize(1/2 cup), Sodium(200), Sugars(1), Totalcarbs(1), Totalfat(0), .. Attributes: Kosher, Natural or Organic IngredientsIngredients: Fresh egg whites.Nutritions: Calcium(N/A), Calories(60), Cholesterol(0), Dietaryfiber(N/A), Fromfat(0), Iron(N/A), Protein(12), Saturatedfat(0), Servingscontainer(4), Servingsize(1/2 cup (122g)), Sodium(200), Sugars(1), Totalcarbs(1), To.. 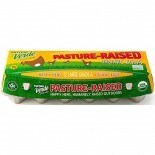 Attributes: Gluten Free, Kosher, Low Carb, Natural or Organic Ingredients, Non-GMO Project Verified , Wheat Free, Yeast FreeIngredients: Pasture-raised Eggs.. 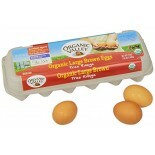 Attributes: Natural or Organic IngredientsIngredients: Whole organic eggs.Nutritions: Calcium(4), Calories(70), Cholesterol(245), Dietaryfiber(0), Fromfat(40), Iron(6), Protein(7), Saturatedfat(1.5), Servingscontainer(12), Servingsize(1 egg (58g)), Sodium(80), Sugars(0), Totalcarbs(.. 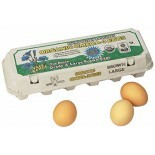 Attributes: Natural or Organic IngredientsIngredients: organic whole eggsNutritions: Calcium(2), Calories(60), Cholesterol(210), Dietaryfiber(0), Fromfat(35), Iron(6), Protein(6), Saturatedfat(1.5), Servingscontainer(12), Servingsize(1 egg (50g)), Sodium(70), Sugars(0), Totalcarbs(.. 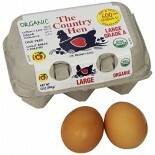 Attributes: Natural or Organic IngredientsIngredients: organic whole eggs.Nutritions: Calcium(2), Calories(60), Cholesterol(210), Dietaryfiber(0), Fromfat(35), Iron(6), Protein(6), Saturatedfat(1.5), Servingscontainer(6), Servingsize(1 egg (50g)), Sodium(70), Sugars(0), Totalcarbs(.. Attributes: Natural or Organic IngredientsIngredients: organic whole eggs.Nutritions: Calcium(2), Calories(60), Cholesterol(210), Dietaryfiber(0), Fromfat(35), Iron(6), Protein(6), Saturatedfat(1.5), Servingscontainer(6), Servingsize(1 egg (50 g)), Sodium(70), Sugars(0), Totalcarbs(.. 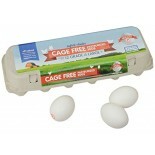 Attributes: Natural or Organic IngredientsIngredients: organic whole eggs.Nutritions: Calcium(2), Calories(60), Cholesterol(210), Dietaryfiber(0), Fromfat(35), Iron(6), Protein(6), Saturatedfat(1.5), Servingscontainer(12), Servingsize(1 egg (50 g)), Sodium(70), Sugars(0), Totalcarbs(.. 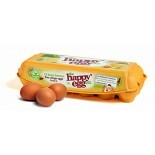 Attributes: Natural or Organic IngredientsIngredients: organic whole eggs.Nutritions: Calcium(4), Calories(70), Cholesterol(245), Dietaryfiber(0), Fromfat(40), Iron(6), Protein(7), Saturatedfat(1.5), Servingscontainer(12), Servingsize(1 egg (58g)), Sodium(80), Sugars(0), Totalcarbs(.. 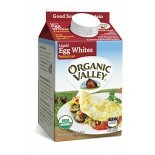 Attributes: Cholesterol Free, Fat Free, Natural or Organic IngredientsIngredients: 100% Organic Egg WhitesNutritions: Calcium(0), Calories(25), Cholesterol(0), Dietaryfiber(0), Fromfat(0), Iron(0), Protein(6), Saturatedfat(0), Servingscontainer(8), Servingsize(1/4 CUP (60G)), Sodium(95), Sugars(0), .. 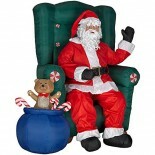 Attributes: Gluten Free, Kosher, Low Salt / Low Sodium / Reduced Sodium, Natural or Organic Ingredients, Yeast Free.. Attributes: Kosher, Natural or Organic IngredientsNutritions: Calcium(2), Calories(70), Cholesterol(215), Dietaryfiber(N/A), Fromfat(40), Iron(4), Protein(6), Saturatedfat(1.8), Servingscontainer(6), Servingsize(1 egg (50g)), Sodium(65), Sugars(N/A), Totalcarbs(.. 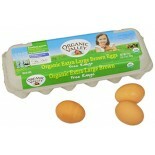 Attributes: Natural or Organic Ingredients, Wheat FreeIngredients: Large brown, grade A, free range eggs. .. 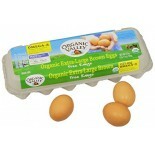 Attributes: Kosher, Natural or Organic IngredientsIngredients: Organic Hard Boiled Eggs. ..